Muskegon District Dental Society Give $500 to the 2014 Mission of Mercy on the campus of Ferris State University. Our donation was received with a $0.50 match for a total donation of $750! At the MDA Mission of Mercy a total of 5,493 dental procedures were provided to 1,136 patients, with each patient receiving about five procedures on average. About half of all procedures were for extensive treatments, such as oral surgery and restorative care. All told $903,000 in donated care was provided during the charitable event held June 7-8 at Saginaw Valley State University’s Ryder Center. 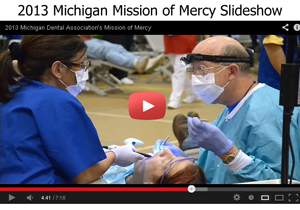 Click the video below view a slideshow of the 2013 Mission of Mercy.